Calcification is a process in which calcium builds up in body tissue, causing the tissue to harden. This can be a normal or abnormal process. Ninety-nine percent (99%) of calcium entering the body is deposited in bones and teeth. The remaining calcium dissolves in the blood. When a disorder affects the balance between calcium and certain chemicals in the body, calcium can be deposited in other parts of the body such as arteries, kidneys, lungs, and brain. Calcium deposits in these parts of the body can cause problems with how these blood vessels and organs work. Calcifications can usually be seen on x-rays. A common example is calcium depositing in arteries as part of atherosclerosis. This entry was posted in Brain and Nervous System, Cardiovascular System, Endocrine System, Kidneys and Urinary System, Locomotor System, Lungs and Breathing. Bookmark the permalink. Hi, I am currently suffering with calcification on my right shoulder which is 5cm long. 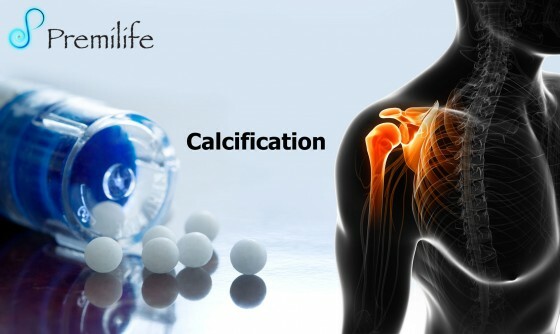 I am looking for an alternative for dissolving the calcification instead of operating. Please urgently reply to my email address. I have calcified foci on right upper zone in my chest x-rays. I want to remove these spots . Due to these spots I am unable to get work permit . I am suffering from Planters calcification from the last 1 year. Is there a remedy available in homeopathic treatment. I have prostate enlargement since 4 years.resently usg small calcification in right lobe of liver detected.please suggest medicine. Thank you. I have faint lungs calcificatiion. Is there any treatement / medication to remove the spots. If so, kindly help me out.